As many of you are aware we are moving towards an amazing event which is to take place on September 23 – 28th. So much has been said about the Final Blood Moon and the days preceding and following this event. I have received many inquiries about this subject. Many of you are worried that something chaotic may happen on or around this date, and whilst chaos certainly is part of this process, what we are about to experience is another wave of Awakening. Just like you have been asleep for years and then suddenly were jolted awake through various “not so pleasant” circumstances in your life, the same is about to happen to others, so on and after September 23rd a massive awakening of human souls is about to take place. Which may be quite tremulous, as that simply is part of the awakening process. However, most of the information that you are sharing with me about the destruction of earth, is not accurate to the best of my knowledge. And although there will be destruction, the destruction that will be there is that of the veil of forgetfulness, the old paradigms of thinking, and old patterns of being. All of this is going away. I also get asked a lot about CERN and what role it will play in this event, and the answer that I have been receiving for months already is that CERN will assist in opening the gateway to Antares. Albeit the original idea was to create it for malicious purposes, since the shift in consciousness that already occurred on this planet, the energy has been shifted enough to overt that which it was built for, and to actually use it as an instrument to assist humanity in moving forward, as quickly as possible. As I mentioned in my previous messages to you in regard to the final blood moon, the times ahead are incredibly auspicious! The old is going away making room for the new, beautiful experiences and synchronistic events to align those of you who are fully ready, with your true life path and missions here on earth. 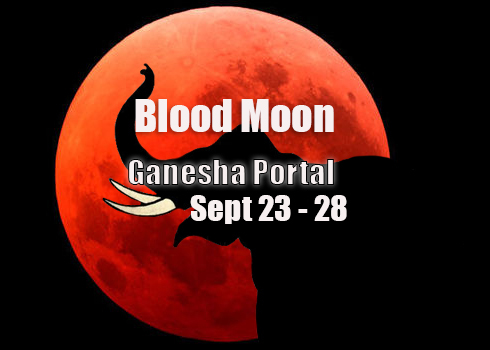 I have also received a message that the portal of the final blood moon is themed as GANESHA or ELEPHANT. It is a portal of TRIUMPH, AWAKENING, POWER, TREMENDOUS OPPORTUNITIES FOR GROWTH AND ENLIGHTENMENT, ABUNDANCE, DISCLOSURE, TRUTH, BENEVOLENCE, PURIFICATION, LOVE, AND LIGHT. “Ganesha is the Lord of success and destroyer of evils and obstacles. He is also worshiped as the god of education, knowledge, wisdom and wealth. Ganesha’s head symbolizes the Atman or the soul, which is the ultimate supreme reality of human existence, and his human body signifies Maya or the earthly existence of human beings. The elephant head denotes wisdom and its trunk represents Om, the sound symbol of cosmic reality. In his upper right hand Ganesha holds a goad, which helps him propel mankind forward on the eternal path and remove obstacles from the way. The noose in Ganesha’s left hand is a gentle implement to capture all difficulties. Symbolic elephant meaning deals primarily with strength, honor, stability and patience, among other attributes. To the Hindu way of thought, the elephant is found in the form of Ganesha who is the god of luck, fortune, protection and is a blessing upon all new projects. Ganesha in all his magnificently vibrant elephant glory, is intent on bulldozing obstacles on your behalf . The strength of the elephant is tremendous. No other animal on land can match the strength of the elephant. It knows its own strength, and confidently strides across the plains aware of its power. It also uses wisdom, and it is very intelligent and thinks things through to all of its conclusions. So, the closer that we get to this date, the lighter and more empowered you are going to feel. However, do keep in mind that as many will be awakening, there may be some chaos around you, as the newly awakened souls will be very confused by the things that they will experience, feel and see. To those uninitiated and especially those who have been coded into following the main stream religions everything that they will experience will frighten them to the core. Many will believe that they are going crazy, and panic. And it will be up to us, those who have already awakened to calm them down and explain that everything that they are going through is an absolutely normal and natural part of awakening. We are then to give them the tools in order to help them. All of this will be happening on the micro level (in our local communities) and macro level (all around the world). For those of you who are done with purification phase, the next steps in your own ascension process will continue to unfold rapidly around you. You will fully walk into your own power. You will be gifted with miracles large and small. Everything in your life will suddenly fall into place, doors will open for you and amazing opportunities will present themselves to you as if on a silver platter. All of this is already underway, but once the portal is opened the communication with your higher selves and other realms shall be that much easier which will allow you to commence your training and truly become a master of your own life and benevolent co-creator of this reality. So as you can see we are heading towards miracles, enlightenment, clearer and more direct communication with our benevolent counterparts, disclosures of all sorts and major changes in our day to day life, with the benign outcome for all involved. Prepare for Celebration, but keep your energies steady, as we are still riding a bit of a rough patch until September 17th, when the energy that all of us are eagerly awaiting will begin fully flowing our way. Remember your own power and utilize all that you have at your fingertips in order to stabilize yourself, cleanse yourself, purify yourself, stay grounded and fully attuned to unconditional love for yourself and those around you. Now having said this here is the channeling that I have received from AA Metatron & the 33rd Dimension. As always I love you all incredibly much! And am superbly grateful to be sharing this journey here with you! Sept. 17 is my birthday. Quite the gift this year. Some Native American cultures have a tradition that when a gift is given you, you must give a larger one in return. Then that person must give you a larger gift in return, and so forth. If this be the Universes gift to us, we will have quite a time returning one. Happy birthday by the way…yes it is great(great gifts this year. My birthday is September 28th. Did you notice any sort of super intensity with hearsay being your birthday? I tend to be a calm one. The intensity goes not a back burner unless it is so intense my body tells me to sleep. The 17th wasn’t a sleepy day like the eclipse was. I talked about important things with my sister. Hello Anna: I just want to share this dream I just had and that was so, but so very powerful. I was in a big city and suddenly a big eagle was flying in the sky. I was inside the house and I was trying to tell my husband to get inside. He was with two being in the middle of the street, children or my two magical dogs. The eagle had huge, very huge wings and I could see the strength of his paws. I could see also the face, the peak, the eyes, so big that was covering all the space available. It starting coming down. I just stood there watching him, knowing that it was coming and that it was inevitable to stop him. Many thanks for your help and work. An elephant faced me in a meditation for Danita Lyn as she was taiking about things in a blog-talk radio show! This was a few days ago now and it was waving the trunk as in a momentum. The trunk was very long and the elephant was very tall! The show mentioned aromatherapy oils too. Anyway, I feel that abundance is coming for all who tune-in to this:) WoW!!! Ganesha~Majestically Magnificent! Joie, this is exciting, thank you. Do you have a site where we can see more of your experiences? hi bill ~ unfortunately, we have not had a website since 2002, when our Ground Crew completed our (then) assignment. i can be reached at and will be pleased to answer some of your questions. We can go from there. Perhaps you are a divine catalyst encouraging me/US to write more down. i noticed the time difference: where in the world are you located? Just the other day I posted on Facebook ‘This morning I feel miracles abound’. What a synchronicity. Thank you. Reblogged this on Perlas de Mariluccie. What interesting comments and positive energies. One should be aware, however, that Ganesh is a human with an elephant’s head rather than an elephant … he’s the son of Lady Parvati’s creation, who gained his elephant’s head, because her husband, Lord Shiva, inadvertently almost destroyed the world by having his general chop of his little boy’s head. If I remember the tale told to me correctly, Lord Shiva then realized his error and had his general chop off the head of the first being he saw, which happened to be a little elephant. The entire tale is delightful and a wonderful lesson. It was told to me many years ago by Prince Hirindra Singh. Light, Joy, Prosperity, and Well Being to All. Thank you Anna. Life is GOOD! 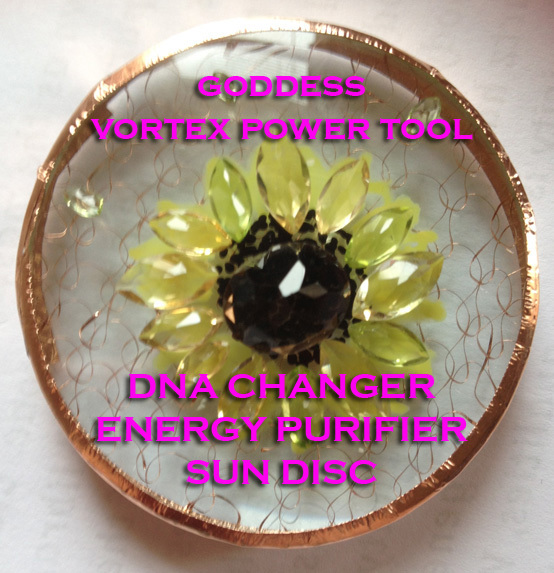 HOW CAN I RECRIVE THR COMPREHENSIVE ENERGY HEALING SESSION & ANALYSIS WITH ANNA MERKABA…. :The DISTANT Healing Session???? Thank you for the information on the astrological events that are taking place at this time, we as those who look within have been waiting for the great nothing for many thousands of years to bring back the balance of the Tao. It is time for the old ones to come through. I learnt from a website that Ganesha will be present with His light-red energies from 17th to 27th Sept and they have given a meditation to do to connect with His presence. I did that on 17th night before going to bed and ask that He give me evidence that He is with me. That night I had a dream where I and one other person (my feeling is it was a woman) plan to go to Mars and that we know there’s a portal somewhere in Norway. To prepare for our trip, we go to a large supermarket kind of place to buy some stuff. It had transparent ceiling and also transparent shelves. Whilst we were there, I saw fighter jets flying above and firing bullets at us by the millions (no exaggeration!). We were ducking down and trying to hide under the shelves which were transparent and fragile. In essence, hiding was useless!! Then I saw two tanks and again, they were firing at us (yes, bullets – despite being tanks!!) Somehow we come out of all this unscathed. In the morning, I was reviewing the dream and trying to suss out why I had such an intense dream!! And then the penny dropped. Mars is red coloured planet – the light red energies of Ganesha in the meditation. In Hinduism, Tuesday which is called Mangalvaar (Mangal is Indian name for Mars) is the day dedicated to Ganesha. So there you go! Ganesha showed me that He was there with me. And not only that but He was protecting me – the reason I came out of this terrible attack unharmed in my dream! Our daughter birthday is September 25th. Francescca is turning 13 years old. We live in Australia and since she was a baby we’ve practiced breathing exercise, positive visualization, the mantra protection, reiki. And I also introduced her the word karma, few years ago, as a way for her to understand the importance that any action or thoughts generate a reaction base on that action and vice-versa…we are great belivers of kidness and compassion. That beautiful way of living was passed to me by mother and now to my daughter. We love and enjoy life. We are very thankful of our peaceful and beautiful life. Love to you all! This was no coincidence to find today. Last year I had a dream that an asteroid was falling into earth and into the sea near where I live. I watched it knowing that a tsunami would follow soon. I ran around trying to tell everyone to wake up, but only a lady carrying a new baby listened. I ran home to take care of my own two children and pack supplies to head for the hills. There were men on horses on the hill watching over us and preparing for a battle maybe. As I left the house to enter the car, a loud thundering roar was heard from the sky behind me. I turned and saw the dark clouds growing darker and a loud booming voice roared, “GANESHA”. I did not know what it meant, but I felt the whole world shake and tremble deep in my soul shuddered and I awoke, terrified. Any ideas of what it means?